TLDR: Government-backed phishing has been in the news lately. If you receive a warning in Gmail, be sure to take prompt action. Get two-factor authentication on your account. And consider enrolling in the Advanced Protection Program. One of the main threats to all email users (whatever service you use) is phishing, attempts to trick you into providing a password that an attacker can use to sign into your account. Our ​improving ​technology has enabled ​us to ​significantly ​decrease ​the ​volume ​of ​phishing ​emails that ​get ​through to our users. ​ Automated ​protections, ​account ​security ​(like ​security ​keys), ​and specialized ​warnings give ​Gmail users industry-leading ​security. Beyond phishing for the purposes of fraud, a small minority of users in all corners of the world are still targeted by sophisticated government-backed attackers. These attempts come from dozens of countries. Since 2012, we've shown prominent warnings within Gmail notifying users that they may be targets of these types of phishing attempts; we show thousands of these warnings every month, even if we have blocked the specific attempt. 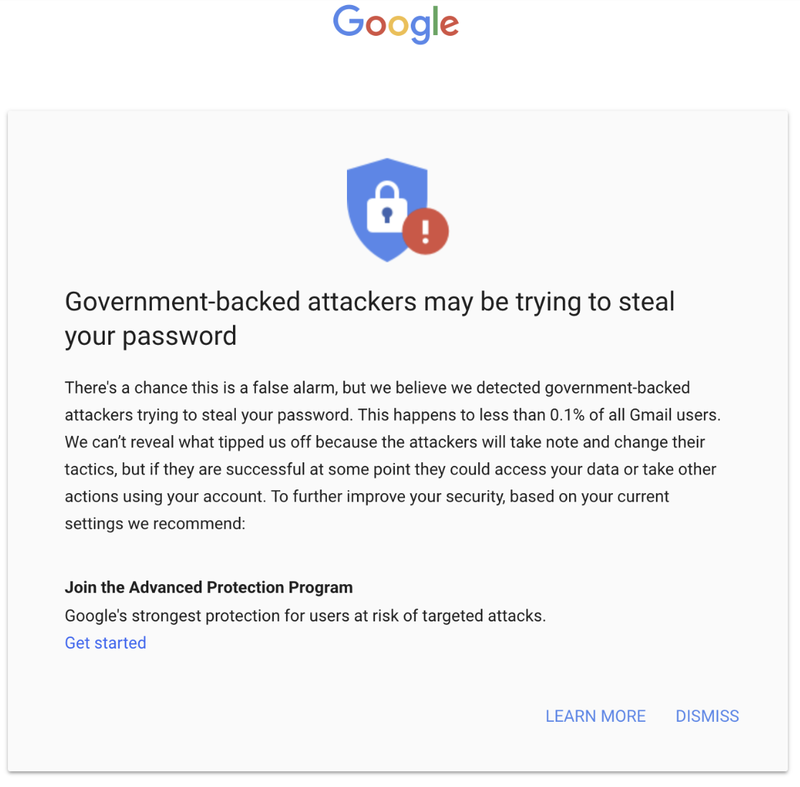 We also send alerts to G Suite administrators if someone in their corporate network may have been the target of government-backed phishing. And we regularly post public advisories to make sure that people are aware of this risk. This is what an account warning looks like; an extremely small fraction of users will ever see one of these, but if you receive this warning from us, it's important to take immediate action on it. We intentionally send these notices in batches to all users who may be at risk, rather than at the moment we detect the threat itself, so that attackers cannot track some of our defense strategies. We have an expert team in our Threat Analysis Group, and we use a variety of technologies to detect these attempts. We also notify law enforcement about what we’re seeing; they have additional tools to investigate these attacks. We hope you never receive this type of warning, but if you do, please take action right away to enhance the security of your accounts. Even if you don’t receive such a warning, you should enable 2-step verification in Gmail. And if you think you’re at particular risk of government-backed phishing, consider enrolling in the Advanced Protection Program, which provides even stronger levels of security. Since 2010, Google’s Vulnerability Reward Programs have awarded more than $12 million dollars to researchers and created a thriving Google-focused security community. For the past two years, some of these rewards were for bug reports that were not strictly security vulnerabilities, but techniques that allow third parties to successfully bypass our abuse, fraud, and spam systems. Today, we are expanding our Vulnerability Reward Program to formally invite researchers to submit these reports. This expansion is intended to reward research that helps us mitigate potential abuse methods. A few examples of potentially valid reports for this program could include bypassing our account recovery systems at scale, identifying services vulnerable to brute force attacks, circumventing restrictions on content use and sharing, or purchasing items from Google without paying. Valid reports tend to result in changes to the product’s code, as opposed to removal of individual pieces of content. This program does not cover individual instances of abuse, such as the posting of content that violates our guidelines or policies, sending spam emails, or providing links to malware. These should continue to be reported through existing product-specific channels, such as for Google+, YouTube, Gmail, and Blogger. Reports submitted to our Vulnerability Reward Program that outline abuse methods are reviewed by experts on our Trust & Safety team, which specializes in the prevention and mitigation of abuse, fraud, and spam activity on our products. We greatly value our relationship with the research community, and we’re excited to expand on it to help make the internet a safer place for everyone. To learn more, see our updated rules. Once upon a time, we launched Google Public DNS, which you might know by its iconic IP address, 8.8.8.8. (Sunday, August 12th, 2018, at 00:30 UTC marks eight years, eight months, eight days and eight hours since the announcement.) Though not as well-known as Google Search or Gmail, the four eights have had quite a journey—and some pretty amazing growth! Whether it’s travelers in India’s train stations or researchers on the remote Antarctic island Bouvetøya, hundreds of millions of people the world over rely on our free DNS service to turn domain names like wikipedia.org into IP addresses like 208.80.154.224. Today, it’s estimated that about 10% of internet users rely on 8.8.8.8, and it serves well over a trillion queries per day. But while we’re really proud of that growth, what really matters is whether it’s a valuable service for our users. Namely, has Google Public DNS made the internet faster for users? Does it safeguard their privacy? And does it help them get to internet sites more reliably and securely? In other words, has 8.8.8.8 made DNS and the internet better as a whole? Here at Google, we think it has. On this numerological anniversary, let’s take a look at how Google Public DNS has realized those goals and what lies ahead. From the start, a key goal of Google Public DNS was to make the internet faster. When we began the project in 2007, Google had already made it faster to search the web, but it could take a while to get to your destination. Back then, most DNS lookups used your ISP’s resolvers, and with small caches, they often had to make multiple DNS queries before they could return an address. 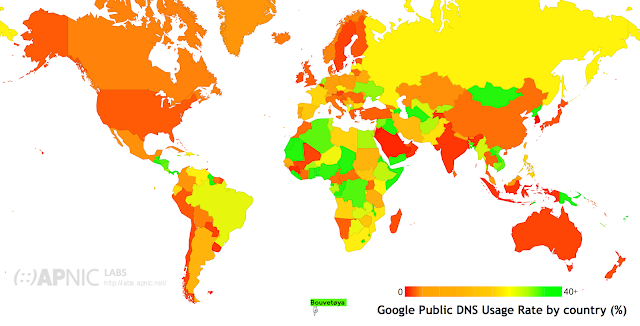 Google Public DNS resolvers’ DNS caches hold tens of billions of entries worldwide. And because hundreds of millions of clients use them every day, they usually return the address for your domain queries without extra lookups, connecting you to the internet that much faster. Speeding up DNS responses is just one part of making the web faster—getting web content from servers closer to you can have an even bigger impact. Content Delivery Networks (CDNs) distribute large, delay-sensitive content like streaming videos to users around the world. CDNs use DNS to direct users to the nearest servers, and rely on GeoIP maps to determine the best location. Everything’s good if your DNS query comes from an ISP resolver that is close to you, but what happens if the resolver is far away, as it is for researchers on Bouvetøya? In that case, the CDN directs you to a server near the DNS resolver—but not the one closest to you. In 2010, along with other DNS and CDN services, we proposed a solution that lets DNS resolvers send part of your IP address in their DNS queries, so CDN name servers can get your best possible GeoIP location (short of sending your entire IP address). By sending only the first three parts of users’ IP addresses (e.g. 192.0.2.x) in the EDNS Client Subnet (ECS) extension, CDNs can return the closest content while maintaining user privacy. We continue to enhance ECS, (now published as RFC 7871), for example, by adding automatic detection of name server ECS support. And today, we’re happy to report, support for ECS is widespread among CDNs. To address this weakness, we launched a public beta of DNS-over-HTTPS on April 1, 2016, embedding your DNS queries in the secure and private HTTPS protocol. Despite the launch date, this was not an April Fool’s joke, and in the following two years, it has grown dramatically, with millions of users and support by another major public DNS service. 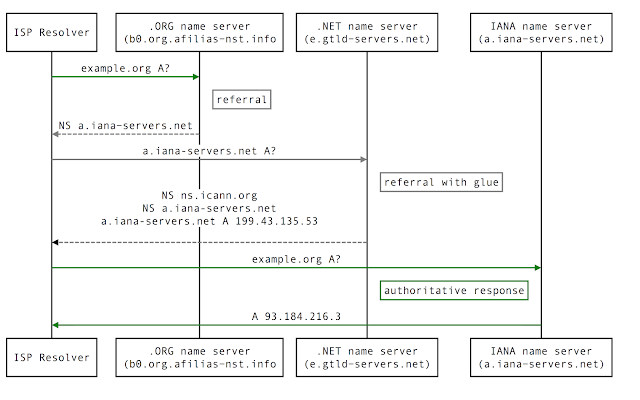 Today, we are working in the IETF and with other DNS operators and clients on the Internet Draft for DNS Queries over HTTPS specification, which we also support. We’ve always been very concerned with the integrity and security of the responses that Google Public DNS provides. From the start, we rejected the practice of hijacking nonexistent domain (NXDOMAIN) responses, working to provide users with accurate and honest DNS responses, even when attackers tried to corrupt them. In 2008, Dan Kaminsky publicized a major security weakness in the DNS protocol that left most DNS resolvers vulnerable to spoofing that poisoned their DNS caches. When we launched 8.8.8.8 the following year, we not only used industry best practices to mitigate this vulnerability, but also developed an extensive set of additional protections. While those protected our DNS service from most attackers, they can’t help in cases where an attacker can see our queries. Starting in 2010, the internet started to use DNSSEC security in earnest, making it possible to protect cryptographically signed domains against such man-in-the-middle and man-on-the-side attacks. In 2013, Google Public DNS became the first major public DNS resolver to implement DNSSEC validation for all its DNS queries, doubling the percentage of end users protected by DNSSEC from 3.3% to 8.1%. In addition to protecting the integrity of DNS responses, Google Public DNS also works to block DNS denial of service attacks by rate limiting both our queries to name servers and reflection or amplification attacks that try to flood victims’ network connections. A big part of Google Public DNS’s tremendous growth comes from free public internet services. We make the internet faster for hundreds of these services, from free WiFi in San Francisco’s parks to LinkNYC internet kiosk hotspots and the Railtel partnership in India‘s train stations. In places like Africa and Southeast Asia, many ISPs also use 8.8.8.8 to resolve their users’ DNS queries. Providing free DNS resolution to anyone in the world, even to other companies, supports internet access worldwide as a part of Google’s Next Billion Users initiative. Today, Google Public DNS is the largest public DNS resolver. There are now about a dozen such services providing value-added features like content and malware filtering, and recent entrants Quad9 and Cloudflare also provide privacy for DNS queries over TLS or HTTPS. But recent incidents that used BGP hijacking to attack DNS are concerning. Increasing the adoption and use of DNSSEC is an effective way to protect against such attacks and as the largest DNSSEC validating resolver, we hope we can influence things in that direction. We are also exploring how to improve the security of the path from resolvers to authoritative name servers—issues not currently addressed by other DNS standards. In short, we continue to improve Google Public DNS both behind the scenes and in ways visible to users, adding features that users want from their DNS service. Stay tuned for some exciting Google Public DNS announcements in the near future!